Dell Technologies has agreed to offload cloud backup subsidiary Mozy to web-based storage outfit Carbonite for $145.8m. Carbonite president and CEO Mohamad Ali said its data protection platform "serves every scenario, from backing up individual laptops to maintaining uptime for hundreds of business servers". "This deal provides Mozy customers scalable options for the future and gives Carbonite a broader base to which we offer our solutions," he added. Mozy was founded in 2005 to provide online end-user backup services, it was bought by EMC for $76m in 2007. Dell inherited the business when it bought EMC in September 2016. The company has consumer (MozyHome) and business (MozyPro for end-points and MozyEnterprise for servers) operations. Carbonite was founded in 2005 to provide online backup services to PC and Mac users. It bought Phanfare in June 2011 and then IPO'd, raising $62.5m, in August that year. In December 2015, the company slurped Seagate's EVault business cloud backup operation for a relatively paltry sum of $14m. SME high-availability product supplier Double-Take Software was bought by Carbonite in January 2017 for $65.25m. Months later in August, the business provided a transition path for Code42 Software's CrashPlan for Home customers when Code42 exited that business. 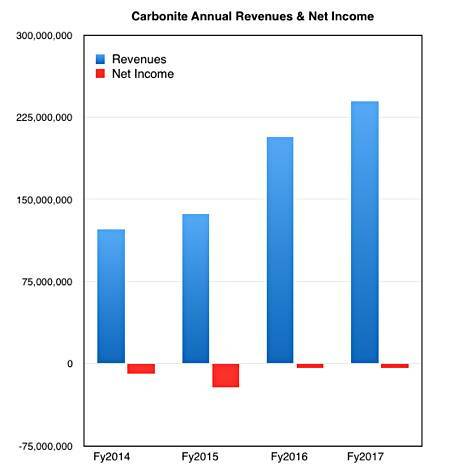 Carbonite yesterday rolled out its fourth calendar 2017 quarter and full-year results. Q4 revenues of $61.7m were 15 per cent year-on-year and a net loss of $1.6m was worse than the $700,000 net loss reported for the same period in 2016. Sales for the entire year came in at $239.5m, 16 per cent higher than the prior year outing, and losses were flat at $4m. Covering itself with glory – or constantly meddling?